Prunus is an economically important genus of deciduous and evergreen trees and shrubs, characterized by a fruit in the form of a drupe, usually white to pink perigynous flowers with five petals and five sepals, simple leaves, and often the production of cyangogenetic glycosides in the seeds and leaves. There are around 430 species in this genus, mainly spread throughout the northern temperate regions of the globe. This genus includes the plums, cherries, peaches, apricots, and almonds. The Prunus genus includes species highly valued for their fruit, as ornamentals, and for timber. The same adaptations that advance the various species own needs for reproduction and survival offer larger ecological, culinary, nutritional, commercial, and aesthetic values. Many of the fruits are readily eaten by numerous birds and mammals, which digest the fruit flesh and disperse the seeds in their droppings. These fruits also are nutritious and very popular food for human consumption, being eaten fresh or cooked. Even the bitter almond, which has toxic amounts of hydrogen cyanide, useful for repelling herbivores, can have its toxicity removed by roasting, and thus a uniquely human way of food preparation makes these fruits and their unique flavor available for people. The flowers, which are useful for attracting pollinating insects, provide the trees with great beauty and an attractive aroma, and make them popular ornamental trees. And some trees, such as the black cherry, P. serotina, are useful for providing wood for construction. Many of the fruits have important health benefits for people, such as cherries, which are a source of vitamin C, dietary fiber, and anthocyanins, and almonds, which offer a rich source of protein, many vitamins, calcium, magnesium, potassium, among other nutrients. The Prunus genus traditionally is placed within the rose family Rosaceae as part of the subfamily Prunoideae (or Amygdaloideae), where it is the largest genus. Prunoideae also includes one extant species of Oemleria, five species of Maderia, 90 species of Pygeus, and three to four species of Prinsepia (Bortiri et al. 2001). However, it sometimes is placed in its own family, Prunaceae (or Amygdalaceae). The Prunoideae (Amygdaloideae) are characterized by have the fruit type as drupes and by a basic chromosome number of x = 9 (Bortiri et al. 2001). A drupe is a fruit in which an outer fleshy part (exocarp, or skin, and mesocarp, or flesh) surrounds a shell (the pit or stone) of hardened endocarp with a seed inside. These fruits develop from a single carpel, and mostly from flowers with superior ovaries. The definitive characteristic of a drupe is that the hard, lignified stone (or pit) is derived from the ovary wall of the flower. Other fleshy fruits may have a stony enclosure that comes from the seed coat surrounding the seed. These fruits are not drupes. The flowers of members of the Prunus genus usually are white to pink, with five petals and five sepals. They are borne singly, or in umbels of two to six or sometimes more on racemes. The flowers are perigynous, meaning a half-inferior ovary (also known as “half-superior,” “subinferior,” or “partially inferior,”) is embedded or surrounded by the receptacle. In some classifications, half-inferior ovaries are not recognized and are instead grouped with either the superior or inferior ovaries. A half-inferior ovary has nearly equal portions of ovary above and below the insertion point. A single two-ovuled carpel becomes a drupe (a "prune") with a relatively large hard coated seed (a "stone"). Leaves are simple and usually lanceolate, unlobed, and toothed along the margin. Many Prunus species produce hydrogen cyanide, usually in their leaves and seeds. This gives a characteristic taste in small (trace) quantities, and becomes bitter in larger quantities. The cyanogenetic glycosides found in Prunus species are amygdalin, prulaurasin, and prunasin. This makes some Prunus species toxic, although the fruit usually is safe. Bitter almonds, produced from Prunus amygdalus var. amara can be dangerous if eaten raw because they yield significant amounts of prussic acid (hydrogen cyanide), from the enzyme emulsin acting on a soluble glucoside, amygdalin. They must be roasted to overcome the toxicity. Likewise, the seeds or kernals of the pits of apricots (Prunus armeniaca) are poisonous until roasted. The leaves of chokecherries, such as P. virginiana and P. virginiana var. melanocarpa) can be poisonous to horses that may eat the leaves. The earliest fossil Prunus are wood, drupe, seed, and a leaf from the middle Eocene of the Princeton Chert of British Columbia (Stockey and Wehr 1996). Using the known age as calibration data, recent research by Oh and Potter (2005) reconstructs a partial phylogeny of some Rosaceae from a number of nucleotide sequences. According to this study, Prunus and its "sister clade" Maloideae (apple subfamily) diverged at 44.3 mya (well before most of the Primates existed). This date is within the Lutetian, or older middle Eocene. In 1737 Linnaeus used four genera to include the species of modern Prunus: Amygdalus, Cerasus, Prunus and Padus. However, in 1754, Linneaus simplified this to Amygdalus and Prunus (Bortiri et al. 2001). Since then the various genera of Linnaeus and others have become subgenera and sections, as it clearer that all the species are more closely related. Bailey (1898, 181) notes, "The numerous forms grade into each other so imperceptibly and inextricably that the genus cannot be readily broken up into species." 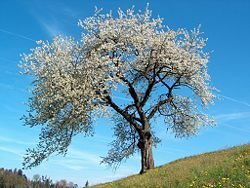 A recent DNA study of 48 species concluded that Prunus is monophyletic and is descended from some Eurasian ancestor (Bortiri et al. 2001). While historical treatments break the genus up into several different genera, such as segregation is not currently widely recognized other than at the subgeneric rank. ITIS (1999) recognizes just the single genus Prunus with the various species and no listed subgenera. Subgenus Amygdalus: almonds and peaches. Axillary buds in threes (vegetative bud central, two flower buds to sides). Flowers in early spring, sessile or nearly so, not on leafed shoots. Fruit with a groove along one side; stone deeply grooved. Type species Prunus dulcis (almond). Subgenus Prunus: plums and apricots. Axillary buds solitary. Flowers in early spring stalked, not on leafed shoots. Fruit with a groove along one side; stone rough. Type species Prunus domestica (plum). Subgenus Cerasus: cherries. Axillary buds single. Flowers in early spring in corymbs, long-stalked, not on leafed shoots. Fruit not grooved; stone smooth. Type species Prunus cerasus (sour cherry). Subgenus Lithocerasus: dwarf cherries. Axillary buds in threes. Flowers in early spring in corymbs, long-stalked, not on leafed shoots. Fruit not grooved; stone smooth. Type species Prunus pumila (sand cherry). Subgenus Padus: bird cherries. Axillary buds single. Flowers in late spring in racemes on leafy shoots, short-stalked. Fruit not grooved; stone smooth. Type species Prunus padus (European bird cherry). Subgenus Laurocerasus: cherry-laurels. Axillary buds single. Flowers in early spring in racemes, not on leafed shoots, short-stalked. Fruit not grooved; stone smooth. Mostly evergreen (all the other subgenera are deciduous). Type species Prunus laurocerasus (European cherry-laurel). Another recent DNA study (Lee and Wen 2001) found that Amygdaloideae can be divided into two clades: Prunus-Maddenia, with Maddenia basal within Prunus, and Exochorda-Oemleria-Prinsepia. Prunus can be divided into two clades as well: Amygdalus-Prunus and Cerasus-Laurocerasus-Padus. Yet another study adds Empectocladus as a subgenus to the former (Bortiri et al. 2002). 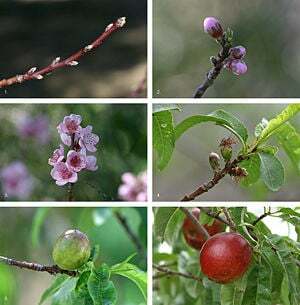 The genus Prunus includes a number of important cultivated species, including the almond, apricot, cherry, peach, and plum, all of which have cultivars developed for commercial fruit and "nut" production. The edible part of the almond is the seed; the almond seed is a drupe and not a true "nut." There are also a number of species, hybrids, and cultivars grown as ornamental plants, usually for their profusion of flowers, sometimes for ornamental foliage and shape, occasionally for their bark. These ornamentals include the group that may be collectively called flowering cherries (including sakura, the Japanese flowering cherries). Other species such as blackthorn are grown for hedging, game cover, and other utilitarian purposes. The wood of some species is a minor and specialized timber (cherry wood), usually from larger tree species such as the wild cherry or black cherry. Many species produce an aromatic resin from wounds in the trunk; this is sometimes used medicinally. There are other minor uses, including dye production. Pygeum is a herbal remedy containing extracts from the bark of Prunus africana. It is used as to alleviate some of the discomfort caused by inflammation in patients suffering from benign prostatic hyperplasia. 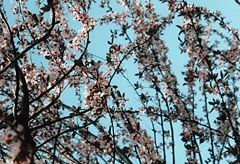 Because of their considerable value as both food and ornamental plants, many Prunus species have been introduced to parts of the world to which they are not native, some becoming naturalized. Bailey, L. H. 1898. Sketch of the Evolution of Our Native Fruits. New York: The MacMillan Company. Bortiri, E., S.-H. Oh, J. Jiang, S. Baggett, et al. 2001. Phylogeny and systematics of Prunus (Rosaceae) as determined by sequence analysis of ITS and the chloroplast trnL-trnF spacer DNA. Systematic Botany 26(4): 797–807. Retrieved August 17, 2008. Bortiri, E., S.-H. Oh, F.-Y. Gao, and D. Potter. 2002. The phylogenetic utility Of nucleotide sequences of sorbitol 6-phosphate dehydrogenase in Prunus (Rosaceae). American Journal of Botany 89(11): 1697–1708. Retrieved August 17, 2008. Integrated Taxonomic Information System (ITIS). 1999. Prunus L. ITIS Taxonomic Serial No. : 24762 . Retrieved August 17, 2008. Lee, S., and J. Wen. 2001. A phylogenetic analysis of Prunus and the Amygdaloideae (Rosaceae) using ITS sequences of nuclear ribosomal DNA. American Journal of Botany 88: 150-160. Retrieved August 17, 2008. Oh, S.-H., and D. Potter. 2005. Molecular phylogenetic systematics and biogeography of tribe Neillieae (Rosaceae) using DNA sequences of cpDNA, rDNA, and LEAFY1. American Journal of Botany 92: 179–192. Okie, W. 2003. Stone fruits. Agricultural Research Service, United States Department of Agriculture. Retrieved August 17, 2008. Stockey, R. A., and W. C. Wehr. 1996. Flowering plants in and around Eocene Lakes of the interior. In R. Ludvigsen, Life in Stone: A Natural History of British Columbia's Fossils. Vancouver, BC: UBC Press. ISBN 0774805781. This page was last modified on 20 August 2008, at 17:13.